Your Health Podcast: From Peacock Finances To Relieved Livers : Shots - Health News This week's podcast features an interview with a scientist who can predict your credit card debt from your city's gender ratio. We hit deep brain stimulation for OCD and the science of how 3-D movies cause nausea. Also, both the Happy Meal and Tylenol are updated this week due to health concerns. 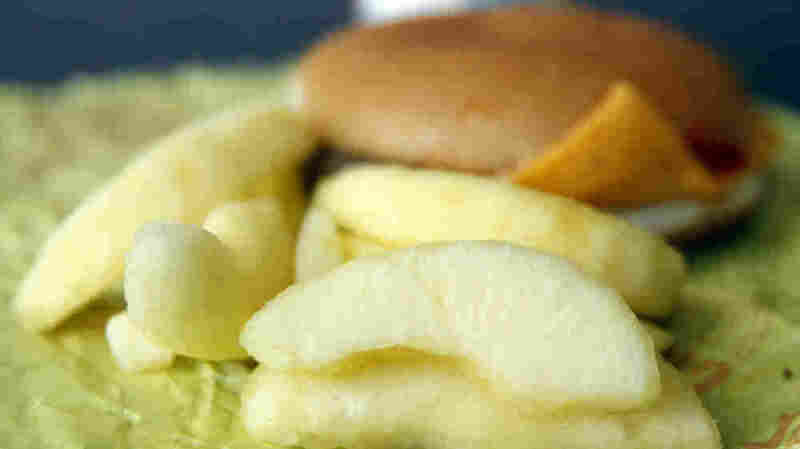 A McDonald's Cheeseburger Happy Meal with apple slices, which are becoming standard fare. You are the same person wherever you are, right? Well, Dr. Vlad Griskevicius might beg to differ. The professor of marketing at the University of Minnesota looked at how people's personal spending behavior varies from city to city. Turns out that there's a strong correlation between the ratio of men to women (really, how scarce women are compared to men) in a given place and how much personal debt people carry. The fewer women are around, the higher the debt load tends to be. The correlation held up in lab studies and has implications for situations in which there are lots of men working in environments with few women. McDonald's has been catering to women's preferences as well — the fast-food chain gave the Happy Meal a makeover this week in the interest of health. This is partially due to feedback from one of its newest team of corporate consultants: mommy bloggers. Have a headache? If you reach for your bottle of Extra Strength Tylenol, soon you'll find that the recommended dose has decreased. The Food and Drug Administration has been concerned about liver damage from acetaminophen, the active ingredient in Tylenol. Now Johnson & Johnson is lowering the maximum dose for Extra Strength Tylenol. Headaches are the least of some people's symptoms when they see 3-D movies or games. We look into the science behind fooling your brain so much it makes you feel nauseated. People who live with obsessive-compulsive disorder have begun to benefit from a technique borrowed from the Parkinson's disease arsenal. It's called deep brain stimulation, and although it doesn't work for all people with OCD, it has helped some. Life expectancies for patients with cystic fibrosis have improved significantly in the past few decades, partially due to daring surgeries. One CF patient, Howell Graham, 49, reminisces about his successful double lung transplant two decades ago and the adventures he's seen since. To subscribe to the Your Health podcast, click here.